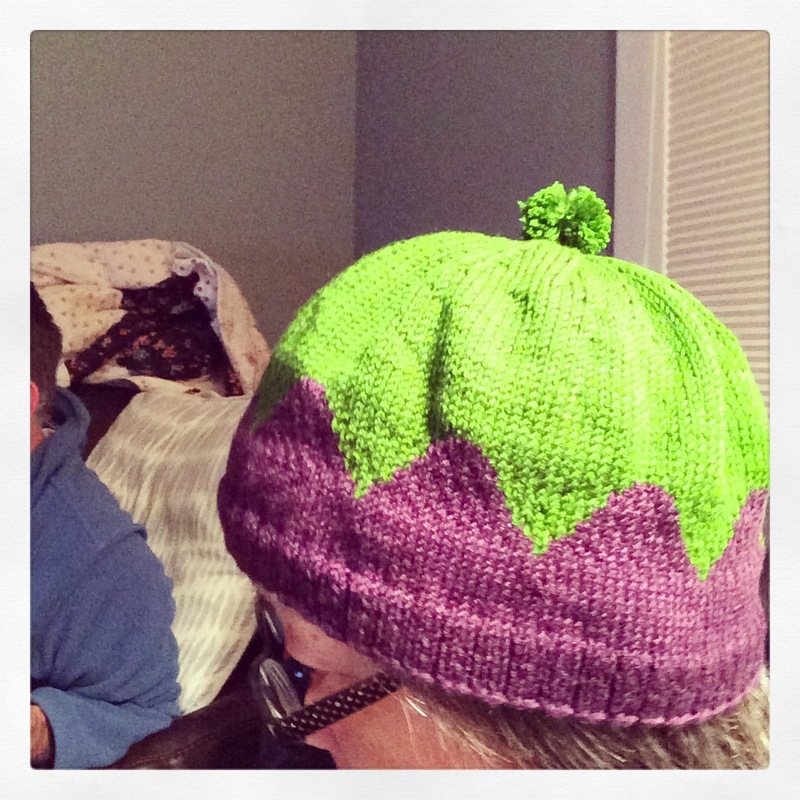 SuperEggplant | Welcome to my adventures in knitting, sewing, baking, and life. I had a hard drive failure! My backups aren’t that great because this server is just for fun, but I think I got most of it back. Now I can’t find my sister to tell me if I have her latest post or not (ungrateful wretch). Anyway, sorry if I lost anything. 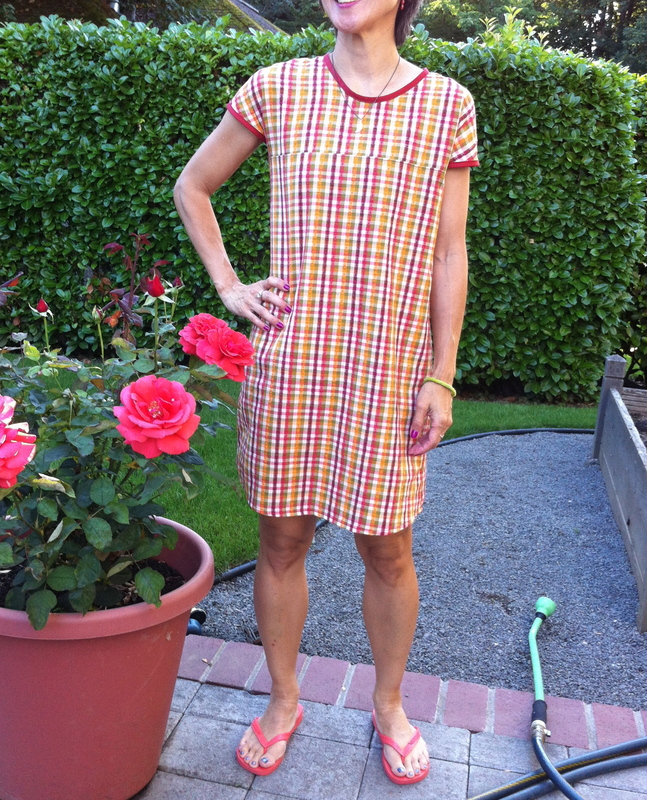 I made another dress from the Machiko Kayaki book! I suspected the dress would be super billowy, and I was right. When I first put it on, it looked like I was an escapee from a medical facility. I chopped off several inches from both sides, and that seemed to help a bit. 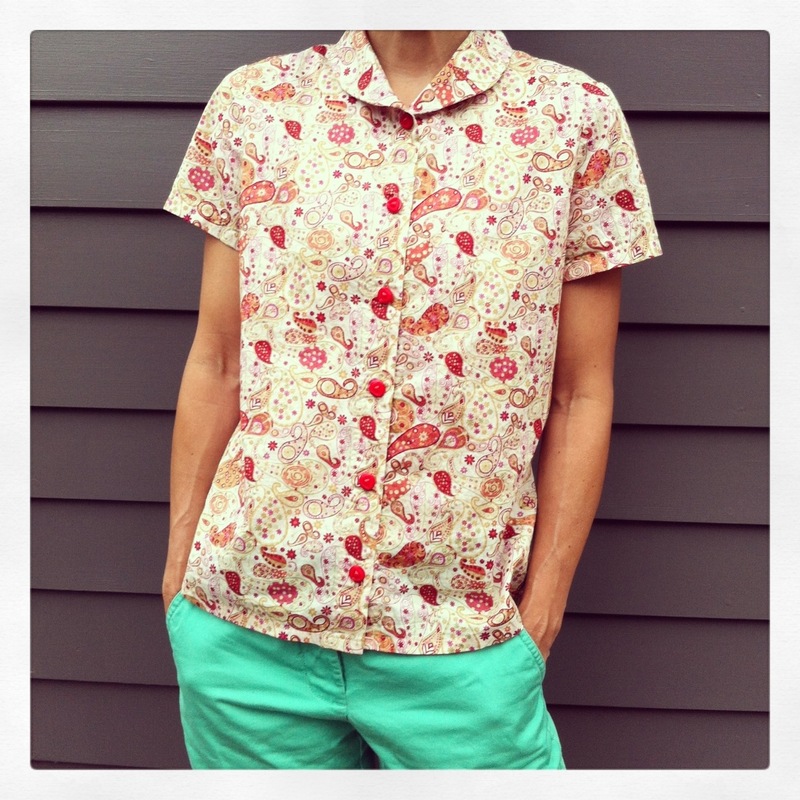 I used seersucker I ordered online from, I can’t remember, maybe Denver Fabrics? Or Fabric.com? I specifically looked for 100% seersucker because I thought that might be a bit more cool/breathable than a cotton-poly blend. When the fabric arrived, I saw that it had a thin silver thread running down each stripe that was not visible in the online photo. I was not deterred, but people, I swear that nearly invisible thread is scratchy! 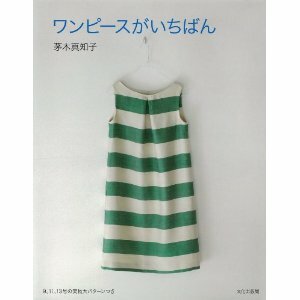 I washed the dress and wore it, and it felt all prickly against my neck and shoulders. I do tend to be kind of sensitive to stuff touching my skin (if one hair falls down my shirt I can feel it, and I have to search and remove the hair), but I am not sure what the deal is with the seersucker. I have been sewing a bit more lately, but I have been too lazy to take photos. That might change. Might. 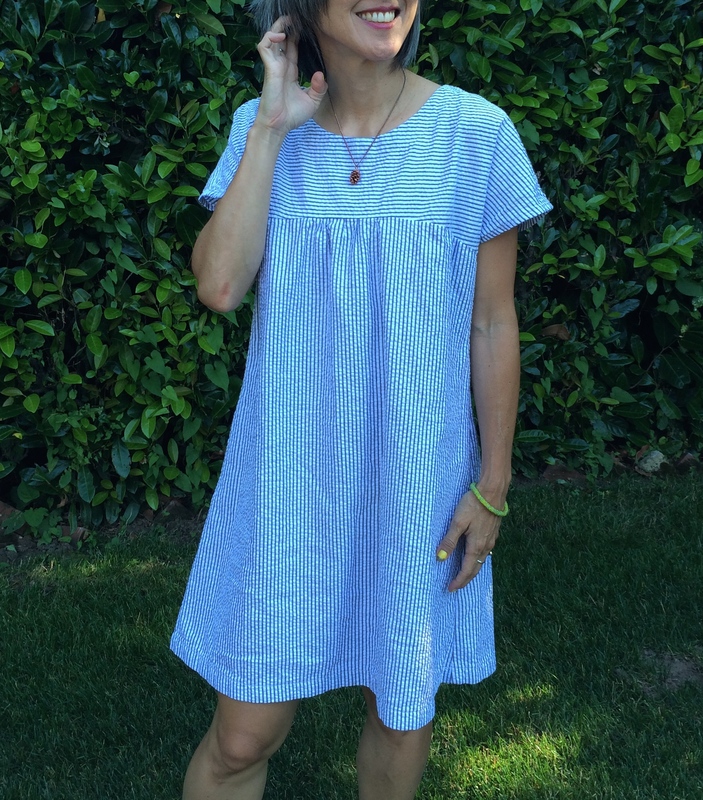 Anyway, I did whip up this dress from the latest Machiko Kayaki book! The book is called, roughly translated, One Pieces are Number One! The ISBN is 978-4-579-11484-9. I ordered mine online from Kinokuniya, and I would provide a link, but the site isn’t working for me right now. 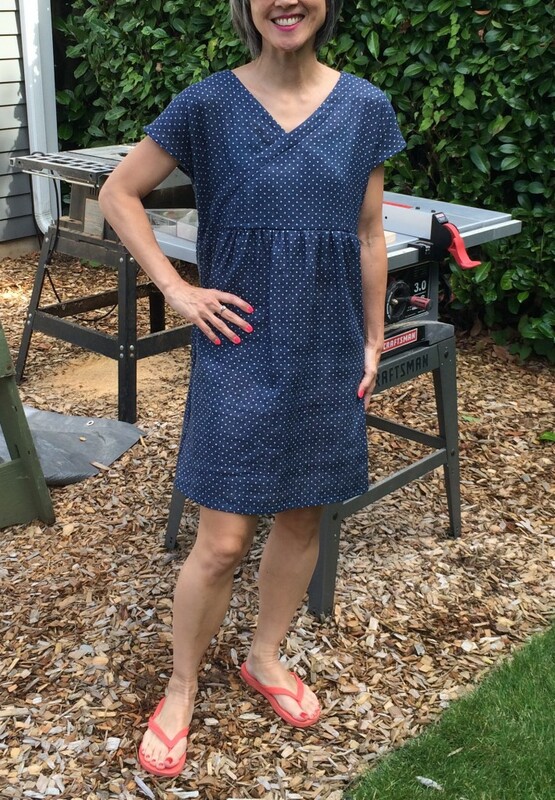 This is dress “c” and I made it with a gauze fabric I got from etsy seller fabricmade. It was pretty straightforward to make, and I think I will get some use out of it on the hot summer days, but it DID come out on the big side, and I made the smallest size. You can see the top of my bra (not in the photo because I strategically shifted the dress), and there is a lot of extra fabric (I kind of bunched it up in the back in the photo). Peter’s initial comment was that it looked like a maternity dress, and then he called it plus size. I think these loose-fitting garments are not particularly flattering on me, but I keep making them. One reason is because I have poor spatial skills and am blissfully unaware that what I am making is tent-size, and the other is because I am generally attracted to these types of garments, and they do look good on some people. I ordered some seersucker to make another dress out of the book. That one also has a gathered skirt, so it will also most likely end up plus size, but hey, at least it will be comfortable! Ahoy! I keep thinking I’m going to start blogging more regularly, but then I don’t. So, I am not going to make any promises or threats here. Anyway, I finished something! I had been admiring the Little Scallops hat for a while, and then hat season rolled around, so it seemed like a good time to make it. I have some issues with knit caps and with hats in general. I am prone to headaches, and I don’t like stuff squeezing my head, even a tiny bit, so I wanted to make a hat that sort of just skimmed my head. I found some super cheap cashmere blend yarn on ebay and redid the pattern a bit. My scallops aren’t as cute as I would like, and the hat came out a little on the big side, but I think it will serve its purpose. I have some more details on my ravelry project page if you are interested. Pardon the cheesy pose, please. Well, summer is over, and we are heading into the colder months! I much prefer summer clothing to winter clothing. I have issues with being cold, and it never seems like there are enough layers for me. I also like to be comfortable and practical (wash & wear), and for me, comfortable seems to equate with frumpy. Another weird thing is that my neck is always cold in the winter, so I end up wearing turtlenecks on a daily basis. I GET TIRED of wearing turtlenecks every day. I do the scarf thing, but sometimes that doesn’t work so well. But this has nothing to do with the sweatshirty thing I made, does it? I got this super soft, double-layered knit fabric from the Fabric Depot outdoor sale a couple of years ago. As you can see, it is striped on one side and dotted on the other. They had this color and this kind of weird purple. I wish they had had more! I decided to make a sweatshirt, but I thought I’d try to make it kind of loose-ish, which seems to be the trend these days. I adapted this pattern from Tamanegi-Kobo by bringing up the armholes quite a bit, making the arms full length, and bringing in the neckline. I still have some mixed feelings about how this came out. The wide band at the bottom didn’t come out exactly as I had envisioned, though I didn’t really have a vision to begin with (you know what I mean). The neckline is still way too wide for my taste. Cold neck! Cold neck! I might take it in a little bit and sew a little tuck in there. Other than that, though, it is super comfy, and I will be wearing it a lot this winter (with lots of layers underneath). The weather forecast called for one final hot week, so I whipped up a summer shift one afternoon. I had this seersuckerish fabric in my stash, and I had been thinking it’d be nice to have just a simple shift, not too snug and not too humongous. I used an extremely technical approach wherein I placed different pattern pieces sporting various elements I desired on top of the fabric. 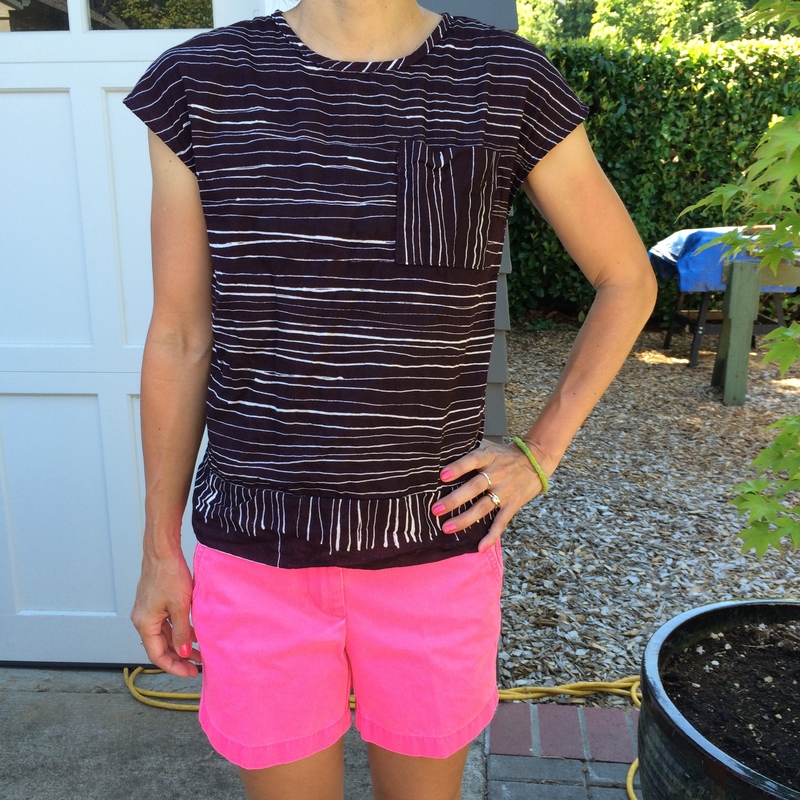 In this case I wanted French seams (super easy! No set-in sleeves!) and a basic dress. I was going to make bias tape, but then I remembered I had some readymade bias tape that came WITH ADHESIVE on it, so you just stick it on! 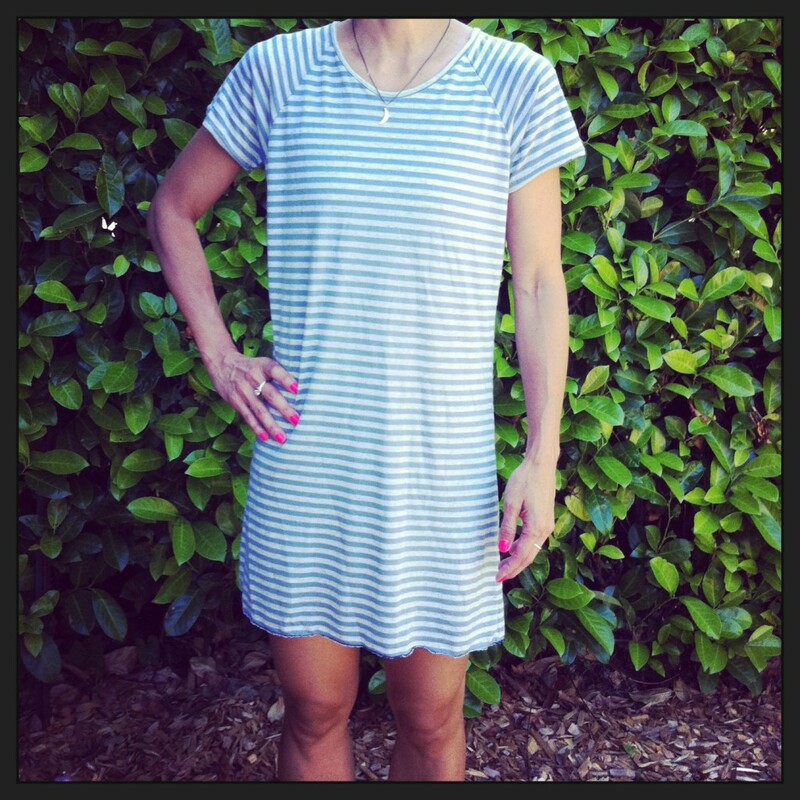 I like the contrast it provides in the neckline and armholes. Okay, so I started putting this together and quickly realized it was going to be too fitted. I contemplated starting over, but I had already completed the neckline and didn’t want to waste it, so I just chopped off the top part and added a new piece for the bottom! Easy peasy! And I didn’t even try to match up the plaid because, well, I am lazy, and I didn’t care. 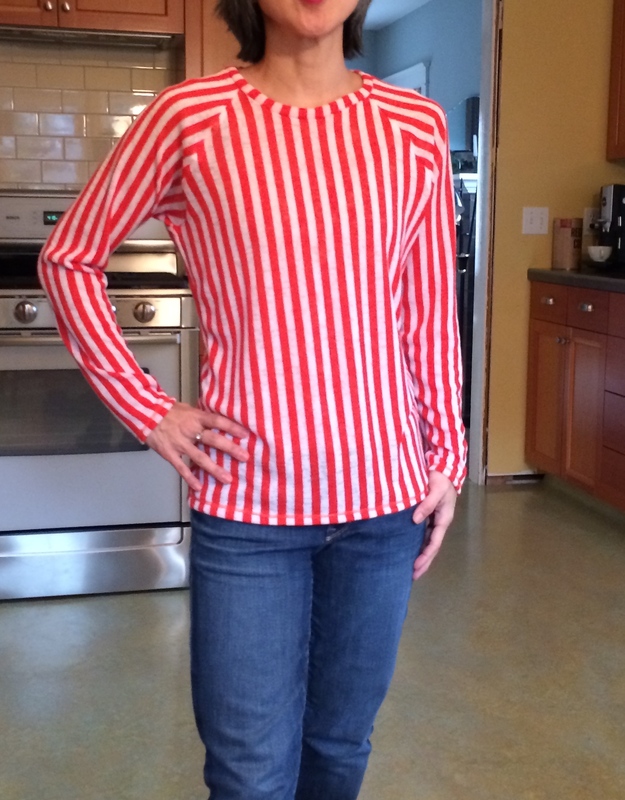 It’s very comfortable and came out pretty much as I had hoped, plus I wore it on a 90+-degree day and felt fine. I have also come to realize that I am a lazy and impatient seamstress who needs immediate gratification. So, you won’t be finding many tailored outfits around here! 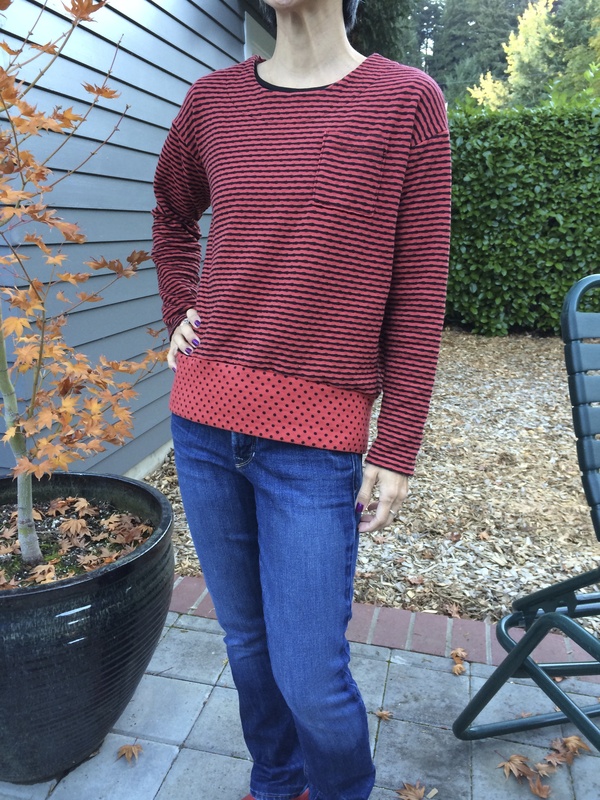 MORE KNITS, people! I also got this fabric from Girl Charlee. It is supposed to be all cotton, and perhaps it is. It is quite lightweight and super drapey. 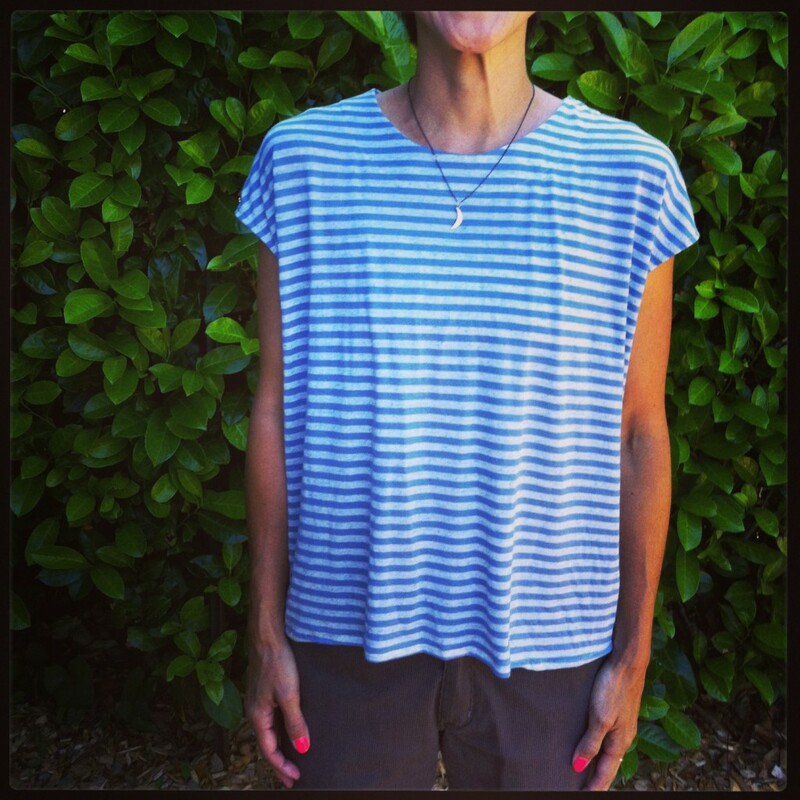 Now, I generally go for a pretty traditional style of t-shirt, but I thought I’d go out on a limb and try to whip up one of the drapey, boxy t-shirts that the younguns seem to be wearing these days. I cobbled together a pattern using this Tamanegi Kobo pattern. I brought the armholes up a bit and made French sleeves, and I lengthened it a bit because I was not going to use the band. The armholes are still pretty gaping, but I don’t really care. The shirt is very comfy and came out better than I thought! If people don’t like being able to see my bra if I lift up my arms, they can look away! I made this t-shirt dress using the same fabric. 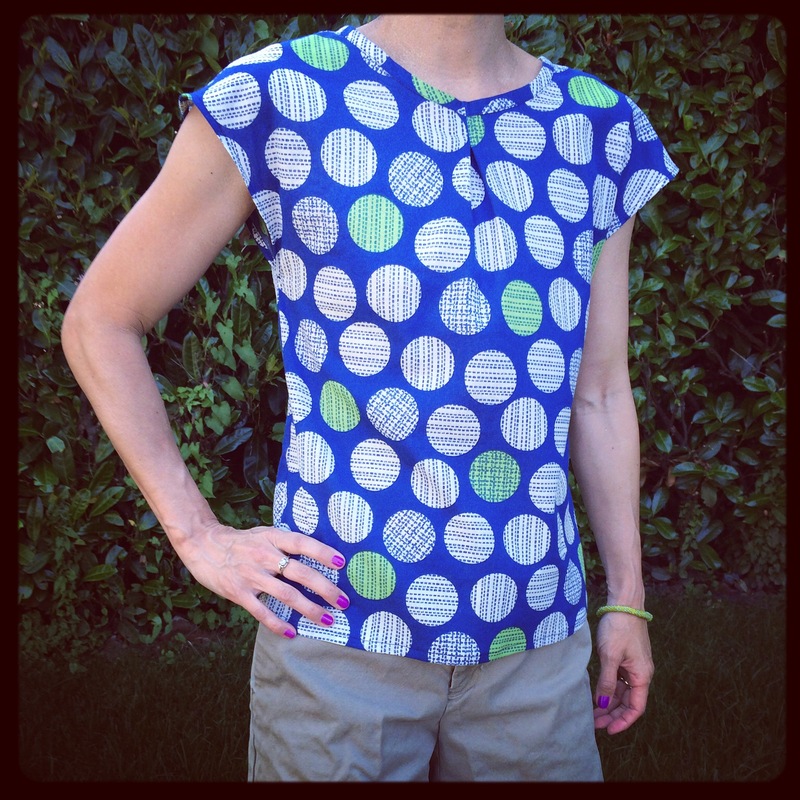 I adapted the raglan t-shirt pattern that has been so popular in my sewing room, har har. When I first made it Peter thought it was too long and suggested I shorten it by “several inches.” I followed his advice, and now I think it is a bit on the short side. It is also somewhat clingy. In other words, it is a bit sluttier than I prefer, but I guess it isn’t SUPER slutty.